DownWithTyranny! : New Election After Republicans Were Caught Trying To Steal A House Seat In North Carolina? New Election After Republicans Were Caught Trying To Steal A House Seat In North Carolina? 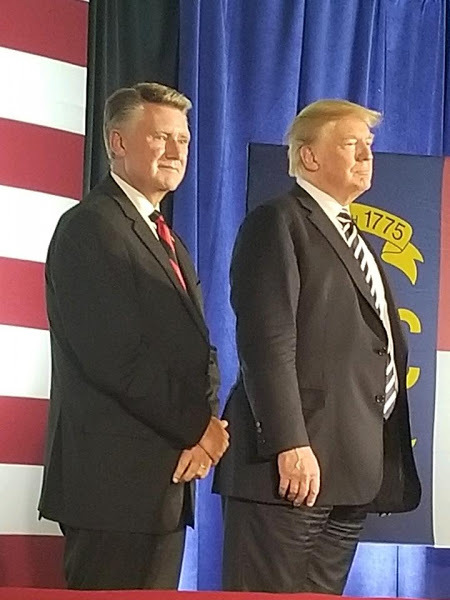 By the end of last month, it was already obvious that North Carolina Trumpist, Mark Harris, had stolen both the GOP primary that ousted Robert Pittenger and then the general election in which he-- against all odds-- beat Blue Dog Dan McCready. 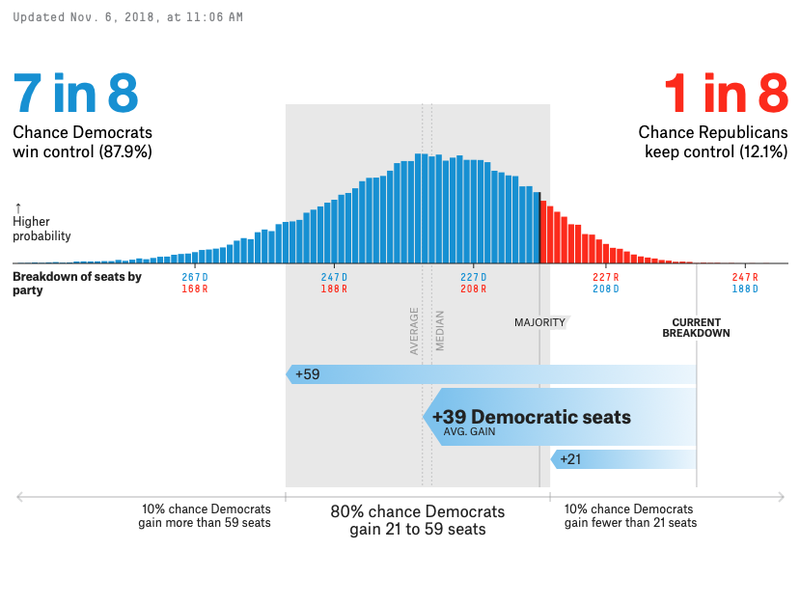 The final 538.com forecast omg November 6, showed Harris with just a 12.1% chance to win (1 in 8). Harris has been in DC pretending that he's the legitimately-elected congressman from North Carolina's 9th district, the state's southern tier, from Charlotte through Monroe, Wadesboro and Lumberton and up to Fayetteville. Everyone knows he tampered with the ballots and wasn't really elected. According to the election tallies that no one believes to be legitimate, Harris beat McCready 138,338 (49.4%) to 136,478 (48.8%). There are 8 counties in the district. McCready won 6, including the biggest (Mecklenburg). But it appears that the absentee ballot scheme that Harris almost pulled off, gave him wins in Bladen and Union counties. Congress-- meaning the Democratic majority-- will decide whether or not to seat Harris. I don't see Speaker Pelosi swearing him in. In all but Bladen County, McCready won among mail-in absentee ballot voters by at least 16 points. In Bladen County, he lost by 24. A Harris capo, notorious crook Leslie McCrae Dowless, Jr., led a crew of thugs who went door-to-door in Bladen County collecting blank or partially-completed absentee ballots, promising to finish and submit the ballots on the voters' behalf. This is an old Republican trick that they do all over the country. Harris was paying Dowless in untraceable cash-- and Dowless passed the cash on to his team for, in effect, buying the absentee ballots. Yesterday, the district's biggest newspaper, the Charlotte Observer, urged the state to hold a new election from scratch, although it makes no sense to allow Harris to participate in one. In the week since the state Board of Elections declined to certify the results of North Carolina’s 9th Congressional District election, journalists and others have begun to fill in the details of a troubling case of apparent ballot fraud. In Bladen County-- and perhaps other counties-- individuals have interfered with the voting process by gaining access to others’ absentee ballots, according to witnesses and records. Investigators also are looking into the burgeoning scandal. There may be no way, however, to know how widespread the fraud was, or whether it involved enough ballots to potentially change the outcome of the election-- a 905-vote victory for Republican Mark Harris over Democrat Dan McCready. But we do know enough. Unless new evidence somehow clears the clouds hanging over this election, the Board of Elections should toss out the 9th District results. Calling for a new election would be an enormously significant decision for the board. It should be done with the support of N.C. statutes and without a whiff of partisan politics. Republicans from Raleigh to Washington would surely howl; already, they’ve noted that the number of absentee ballots cast in Bladen County falls short of the overall margin of victory in the 9th. This is true. But witnesses have said that their ballots, which were collected by individuals apparently working for ringleader McCrae Dowless, were never submitted to the county or state. There’s little certainty about how many ballots were wrongly tossed or destroyed in Bladen County (there were more than 1,500 that were requested but unreturned) or how much Dowless and his workers may have done the same in neighboring Robeson County, as reports suggest. It might have been enough to change the outcome of the race. It might not have been. That possibility, however, triggers a statutory threshold for holding a new election. North Carolina General Statute 163A-1180 authorizes the Board of Elections to intervene and “take any other action necessary to assure that an election is determined without taint of fraud or corruption and without irregularities that may have changed the result of an election.” The board should call for a new NC-09 general election. The U.S. House can and should order a new primary, given that results show Harris winning a startling 96 percent of the Bladen absentee vote in his narrow 2018 primary victory over then incumbent Robert Pittenger. Questions remain about how much Harris knew about the work being done on his behalf. Both he and his chief consultant, Andy Yates, contend they weren’t aware of any election fraud in the 9th District, but Dowless was well-known as a dicey figure in N.C. political circles. He’s a convicted felon who had been investigated for similar fraud in 2016, and he even was featured nationally in a This American Life episode. Harris, at the least, should have seen the smoke. Voters in the 9th District deserve the confidence that their election was free from fraud. North Carolina statute supports it. The evidence already demands it. The Board of Elections should start the election over. Yesterday, Gerry Connolly (D-VA), who will be second in command on the House Oversight and Government Reform Committee in a few weeks, wants the committee to call an emergency hearing immediately to look into Republican vote tampering in NC-09, calling it "real election fraud... Votes have been stolen by preying on senior and minority voters, and now a cloud of doubt and suspicion hangs over this election result. It is incumbent on Chairman Gowdy to hold an emergency hearing before the end of this congressional session so that we can shed light and understand what happened in this race." The Hill reported last night that "Over a thousand absentee ballots from likely Democratic voters may have been destroyed... as allegations of fraud on behalf of the Republican candidate mount. 'You’re looking at several thousand, possibly 2,000 absentee ballot requests from this most recent election. About 40 percent of those, it appears, at this point may not have been returned,' Wake County District Attorney Lorrin Freeman told CNN... Steny Hoyer (D-MD), the next House majority leader, said Tuesday that Democrats will not seat Harris until the allegations are resolved." In an exclusive interview, McCready told Joe Bruno that he thinks Harris not only knew what McCrae Dowless was doing but that he was bankrolling "criminal activity." CNN interviewed Bruno (below). Dallas Woodhouse, executive director of the North Carolina Republican Party, was also on CNN where he hinted that the state party might support a new election if allegations of fraud are proven true and if it impacted the outcome of the race. If allegations of fraud are proven true, the perps shouldn't be allowed to participate in a new election unless it's from a prison cell. Woodhouse: "This has shaken us to the core. We are not ready to call for a new election yet. I think we have to let the board of elections come show their hand if they can show that this conceivably could have flipped the race in that neighborhood, we will absolutely support a new election." If the US of A were still truly a nation of laws (work with me), then yes. Since Republicans have stolen control of the government at all levels and the democraps bring plastic butter knives to war-zone assault rifle firefights, then not a chance. I will say that for once Nancy Pelosi is making the correct plan by threatening to not seat the GOP election theft beneficiary. threatening ain't doing. absent an admission of fraud by the Nazis, I'd bet you she seats the pos. the democrap party are cowards and Pelosi is the least brave of all the cowards. If Nancy does as you feel she will, would that not constitute prima facie evidence that the democraps cannot be trusted and deserve no support from the voters? well, yeah 5:06. But no jury in the land needs MORE prima facie proof. We have had all we need for over 30 years. And yet here we are, 5:51. Lonely voices crying out in the wilderness and largely going unheeded. We do what about this? Well, 8:42, there comes a time in the decline of every civilization and species where the few who could actually save them go unheeded by the masses. This is one of those. We evolved to dominate the planet because of certain traits. Now those same traits insure our own demise. humans have been around for about 600K years; have been terra-forming for about a millennia; and are totally incapable of stopping themselves from doing that which will force their own demise. In geologic time, it's analogous to the duration of one wavelength of light. Neither earth nor the universe will lament our brevity of existence nor our demise. I see no reason to wax poetic about it. The earth will be lifeless in another couple billion years anyway due to the evolution of our sun into a red giant. can't be stopped. what we do this century will be moot.